When I was young, I was very interested in feeding fishes. My good friend and classmate Aliang also loved the fishes. I gave him 10 peafowl fishes in 1996. From then on, he started to feed fishes. 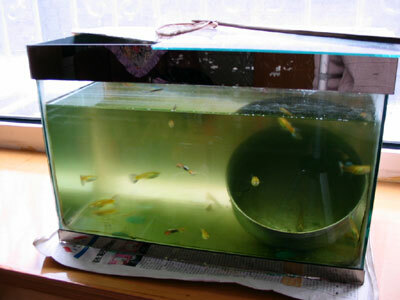 Because of busy school work, his father helped him feed the fishes. The progenitive ability of peafowl fishes is doughty. Popularly, A female fish can propagate 13 to 40 young fishes every 40 days. So my peafowl fishes became more and more. I stopped feeding fishes in 1999, because I was so busy. However, I loved the fishes very much indeed. Aliang and his dad always feeded peafowl fishes during these 9 years. This photo below was shot by me yesterday, these are Aliang's peafowl fishes.